We love those little tiny mints, you know the kind that come in those small, flip top tins. I usually pick up a couple of tins when I do the Aldi shopping, but at $1.99 a tin, and being in the middle of a Spending Freeze, I left them at the store this week. I keep a tin in my handbag and one in the car, Wayne has them at his desk and in the van, and we both unconsciously nibble them almost constantly. Apart from the damage this is doing to our Spending Plan, they really are not at all healthful, even if they are sugar free. So you can imagine my surprise and joy when I found a recipe and the instructions for making them, in a book I'm reading at the moment, Making It by Kelly Coyne and Erik Knutzen. Today being Hannah's work experience day, she has made the mints, with a few changes to the original recipe, and I am thrilled to post this, her very first blog post, complete with her photos. 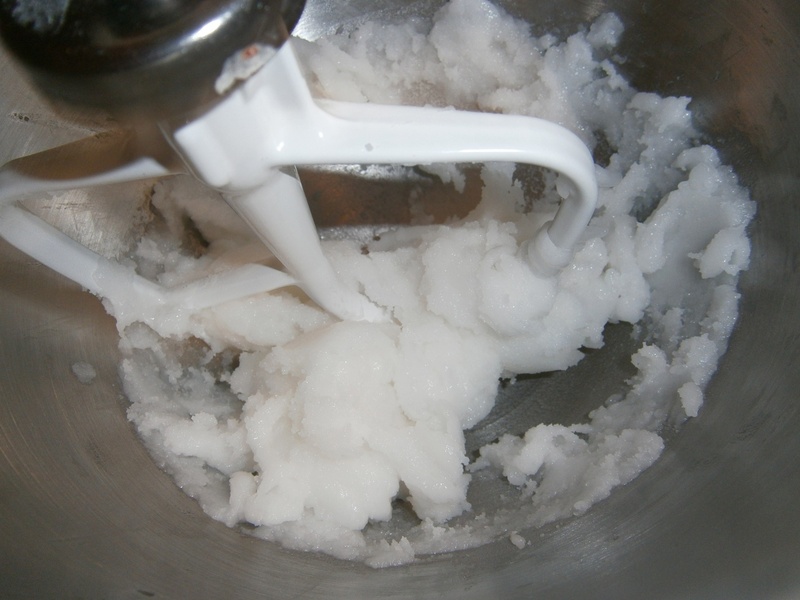 In a small saucepan, combine the sugar, water and cream of tartar. Stir until all the sugar has dissolved. 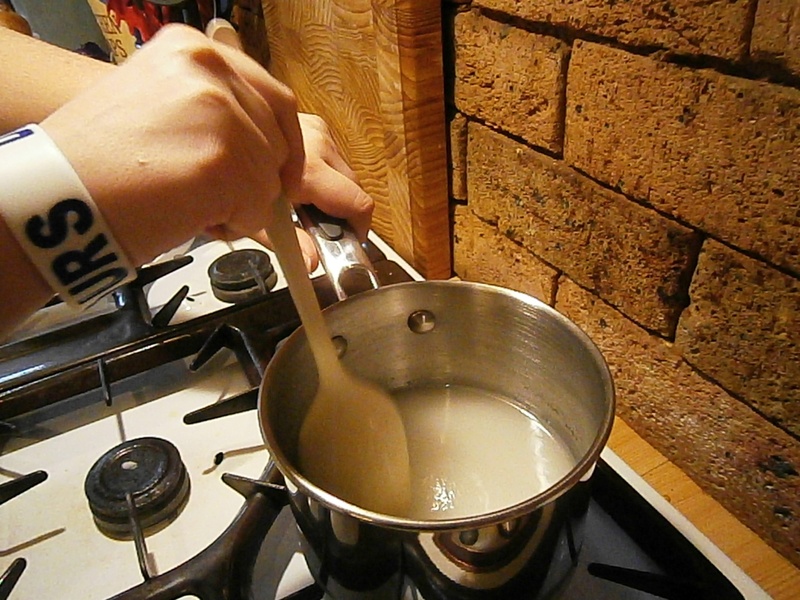 Bring the sugar water to a simmer over a medium heat. Do not stir. Heat syrup to 115C. If you’re unable to tell the temperature you can do the cold water test. The cold water test: every minute or so get a spoon and a little bit of the syrup. Put the syrup in to a bowl of cold water, with that see if it has dissolved. If it has not dissolved put your fingers in and see if you can roll it around with your finger tips and make a soft ball, but won’t hold its shape. Once it has reached the soft ball stage take the pan off the stove. All up this takes about 15-20 minutes. With your mixer and the paddle attachment, pour the hot syrup into the bowl and put onto a low speed. The syrup will turn cream then white then break into crumby bits – this is the fondant. This takes about 10 minutes. During the mixing scrape down the sides so it evenly gets mixed. When it reaches the crumb stage turn off the mixer and let the crumbs cool off for about 10-15 minutes before you knead them. Knead the crumbs until they all come together in a smooth ball of fondant. You need to let the fondant rest over night. Put it in a covered container with icing sugar on the bottom (stops it from sticking) and leave if for 12-24 hours. The fondant will last a couple of days at room temperature, for long term, store it in the fridge. This takes about 5 minutes. We let the fondant sit on the kitchen bench overnight to set. The next day or whenever you get to it sprinkle icing sugar on a cutting board. Knead the fondant till it has a nice smooth texture. 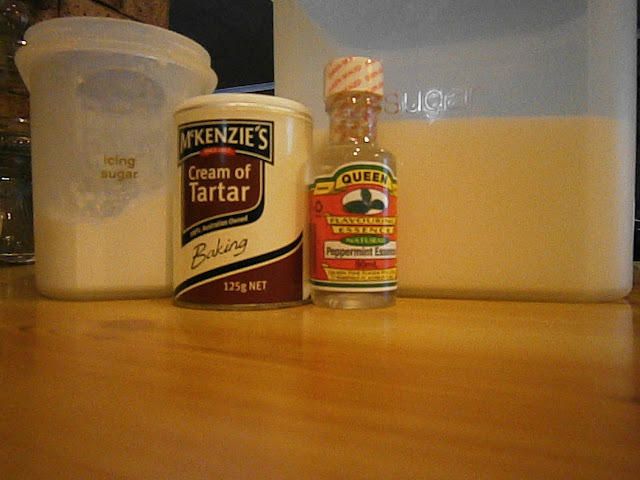 Wet your hands, this will help moisten the dough if it seems dry. Once smooth flatten it out to a pancake shape and add the flavouring on top by sprinkling evenly over the fondant. This can be any flavour you want it to be, we like mints so we used peppermint. Orange, lemon, strawberry or even cinnamon would be nice. Fold over the dough and knead it, this distributes the flavouring evenly. Taste it, you can add more flavouring if you want. This stage takes about 5-10 minutes. You’re able to shape the mints anyway you like. But the easy way is to roll the dough into snakes. Then use a sharp knife to cut the dough to make small oval shaped slices. 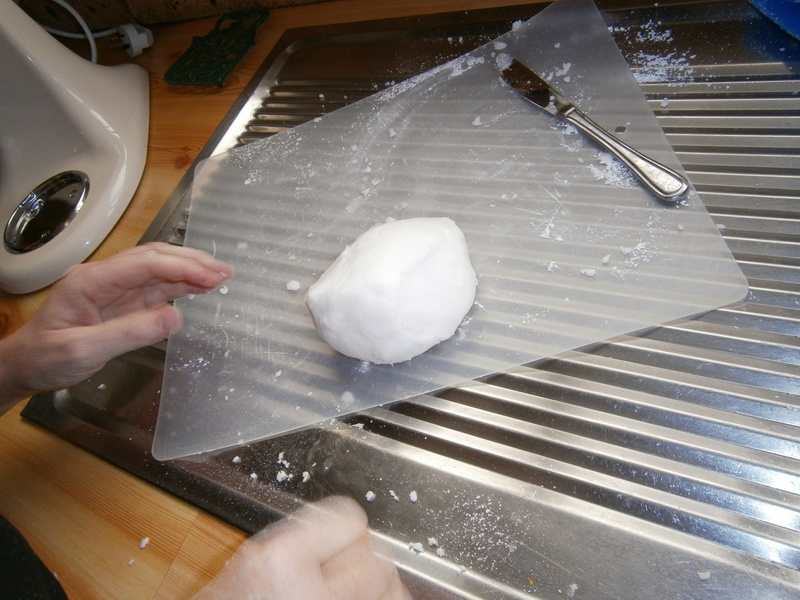 Dust a tray or plate with icing sugar and place the mints on it. It will take a few days for the mints to get hard, may even be a week, depending on the weather. Leave them covered on the bench, if it’s humid place them in front of a fan. We cut the fondant into little stars using the nozzle off a piping bag so they are a similar size to the mints we used to buy. This stage takes about 10-15 minutes. These mints are very easy to make and really don't take very long as most of the time is spent with the fondant taking care of itself. MOOing them saves a fortune. Blitz Mints from Aldi cost $55.30 per kilo. MOO Mints cost just $1.60 per kilo. That's a saving of $53.40 for about an hour of your time, not a bad pay rate!